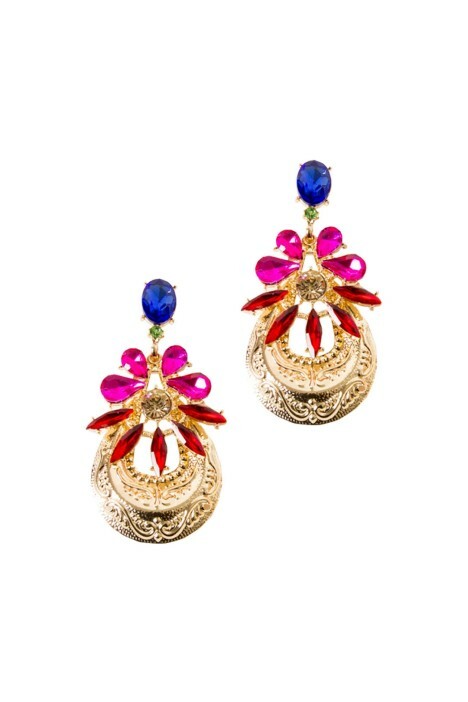 A gorgeous pair of jewel toned crystals give life to this vibrant Indian-inspired work of art. Crafted out of gold plated metal, tonal red coloured crystals act as a delicate centrepiece that frames out into colourful dual-tone blooms, making these drop earrings a must have piece to pair against some feminine frills or give balance to a halter neck playsuit available for rent. Get yourself ready with these statement flower plate drops for a spring festival or as a birthday party standout. Compliment it with a playful hair braids and a glossy ruby lip to match. If you want to be bold, read our blog on how to style makeup with a complete red look!